Are you looking for a unique way to reward your sales staff for their great work? JADA often hosts groups large and small as a reward for a job well done. 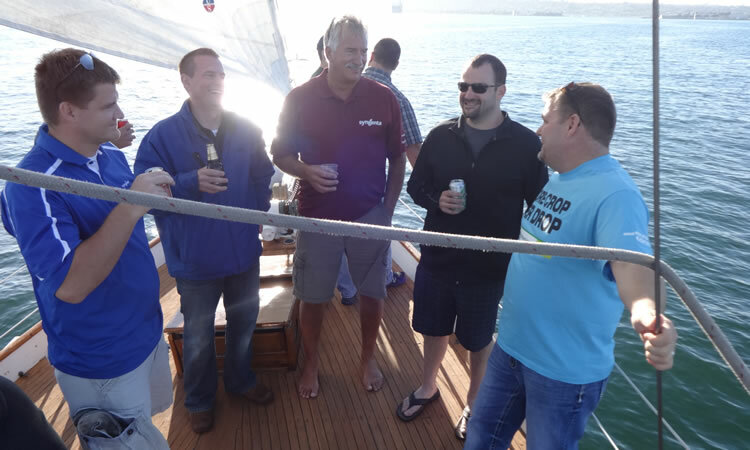 Bring your team out for a sail on San Diego Bay filled with laughter and camaraderie. Few events in life are more relaxing and rewarding than a sail on the classic 1938 racing yacht JADA. We will provide soft drinks, wine, beer, and snacks; you will provide the smiles and laughter. Allow us to show your team just how much you respect their hard work. We are available for morning meetings, afternoon sails, cocktail receptions, dinners and sunset cruises. Make JADA the platform for a memorable reward. Unique, thoughtful, and enjoyable, a trip on JADA will revitalize and excite your team. Professional team building staff are available or choose more casual activities and mingling. Please call Carole at 858-222-9479 to make all the arrangements. Food and beverage options available.